In my last TIF post I mentioned an unbidden image which came up for me when I read Sharon B's April TIF concept. I said I would incorporate that image into my April TIF challenge piece.The image was of myself as a baby in a crib. I've heard some stories over the years from various family members about those early days. Not all of them very happy ones. I have the sense that a lot of us may have been asked to spend quite a bit more time our cribs than was actually necessary. Just a guess. Probably for that reason, I'm not a big fan of cribs. Both my daughters slept with my husband and I for the first few months after which we moved them to a futon on the floor of their own bedroom. It was much easier to change the baby, put her down to sleep and easier to deal with her when she woke up crying in the night; we would just go in and lay down for a while on the bed. It worked for us. 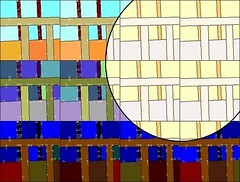 I thought about the crib image for a while, not sure how it might inspire a small quilt or piece of textile art. 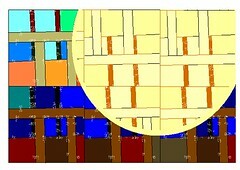 After awhile I came up with the idea of a repeat block based on the bars of a baby crib. 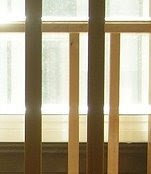 Below left is an image cropped from a photograph of a crib. 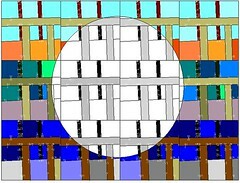 Below right is a quilt block based on the image. Here is the block repeated four across, three down. and simplified the whole thing somewhat by removing half of the blocks for a total of six blocks instead of twelve. I also flipped over some of the blocks to break up the patterning a bit. The sun then became a much bigger part of the overall composition. I wasn't sure what kind of a time commitment this would turn out to be but the next step was to take it to fabric, which would represent the element of positive transformation that I also wanted to convey in the work. The idea of positive transformation is also addressed by taking a somewhat heavy memory and injecting it with colour and movement. I like the way you broke up the spaces. The crib bars are an interesting image. One of my first memories was looking through the bars as an aunt came into the room. There are photos of my older broher and I using it as a jungle gym. I later took up gymnastics! I really appreciate seeing how you got from the first drawing to the design. Like the symbolism too.